The traditional method of converting waste to energy is by burning it directly in a special combustion chamber and grate, a process which is often called mass burning. The dominant European technologies use this system. These involve specially developed moving grates, often inclined to control the transfer of the waste, and long combustion times to ensure that the waste is completely destroyed. Designs have evolved over 20-30 years and are generally conservative. More recently, fluidised-bed combustion systems have sometimes been used in place of traditional grates. 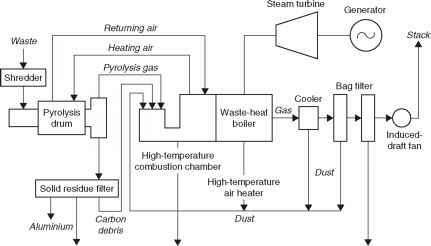 Such systems are good at burning heterogeneous fuel but they require the waste to be reduced to small particles first. These systems remain relatively rare. The actual grate forms only a part of a waste treatment plant. A typical solid-waste combustion facility is integrated into a waste-collection infrastructure. Waste is delivered by the collecting trucks to a handling (and possibly a sorting) facility where it must be stored in a controlled environment to prevent environmental pollution. 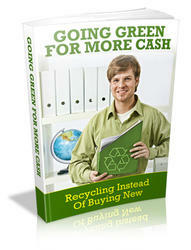 Recyclable materials may be removed at this stage, though metallic material is often recovered after combustion. Grabs and conveyors will then be used to transfer the waste from the store to the combustor. Plant components, and particularly the grates, must be made of special corrosion-resistant materials. The grate must also include a sophisticated combustion-control system to ensure steady and reliable combustion while the quality and energy content of the refuse fuel varies. In some more modern systems oxygen is fed into the grate to help control combustion. The temperature at which the combustion takes place must usually be above 1000°C to destroy chemicals such as dioxins but must not exceed 1300°C as this can affect the way ash is formed and its content. Hot combustion gases from the grate flow vertically into a boiler where the heat is captured to generate steam. The combustion process in the grate and the temperature profiles within the boiler have to be maintained carefully in order to control the destruction of toxic chemicals. Most of the residual material after combustion is removed from the bottom of the combustion chamber as slag. However there may be further solid particles in the flue gases, some of which can be recycled into the furnace. atmosphere but continuous monitoring systems are required to make sure that emission standards are maintained. Dust from the flue gas filters is normally toxic and must be disposed of in a landfill. Other flue gas treatment residues will probably need to be buried too. The slag from the combustor may, however, be clean enough to exploit for road construction. 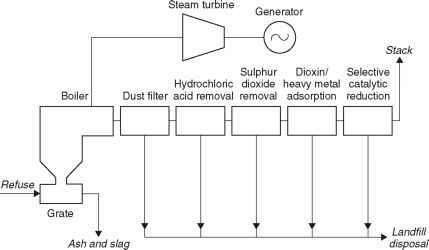 Modern mass-burn plants aim to generate slag that can be utilised in this way. Mass-burn plants may burn up to 2000tonnes/day of MSW. Where a smaller capacity is required, a different type of combustion system, called a rotary kiln, can be employed. As its name suggests, this system uses a rotating combustion chamber which ensures that all the waste is burned. The chamber is inclined so that the material rolls from one end to the other as it burns. Such combustors are capable of burning waste with a high-moisture content, perhaps up to 65%. Capacities of rotary kilns are up to 200 tonnes/day of refuse, suitable to meet the needs of small urban communities.